Hello there sweet friends! As far as decorating our home goes, I don't like to leave things the same for too long. 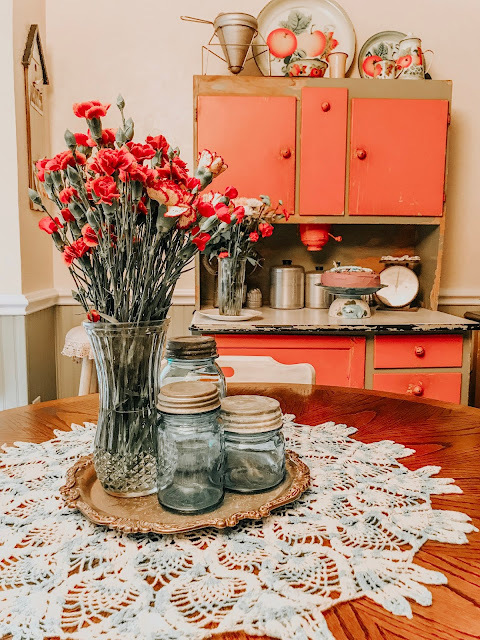 I love to change out the flowers on our dining room table quite often, so I thought I'd show you a few of my ideas. These are all for a Spring centerpiece theme. 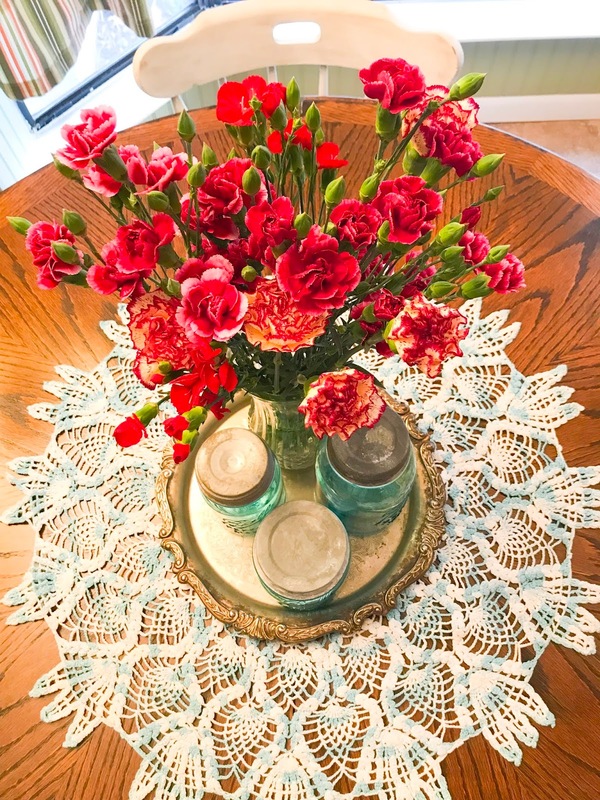 I normally start out with one of my beautiful crocheted doilies as a base and then create the centerpiece from there. 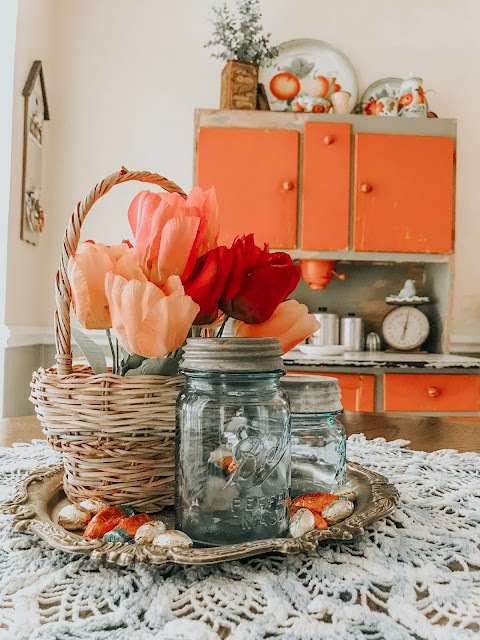 First up is Dollar Tree tulips in a sweet thrifted Easter basket. Here I used a silver tray, then filled it with Ball jars, a basket with flowers and some Easter candies here and there. Love it! So sweet and pretty. This one is basically all the same pieces, except here I'm using fresh flowers my honey brought me and I've placed them in a tall glass vase. 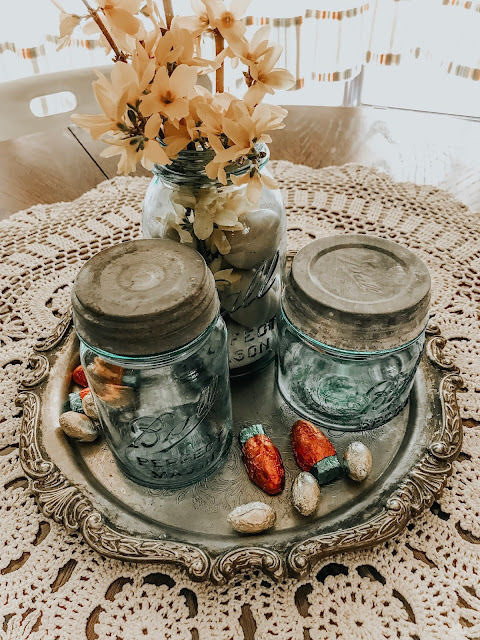 My blue vintage Ball jars are always an easy item to to add to my decor. These three are the newest to my collection so I think that's why I just kept using them here. Love them! These flowers lasted so much longer than normal and many of them opened up much more after about 4 days. I think they were just happy to be away from the grocery store's crowded display! Here I am using the Ball jars again. 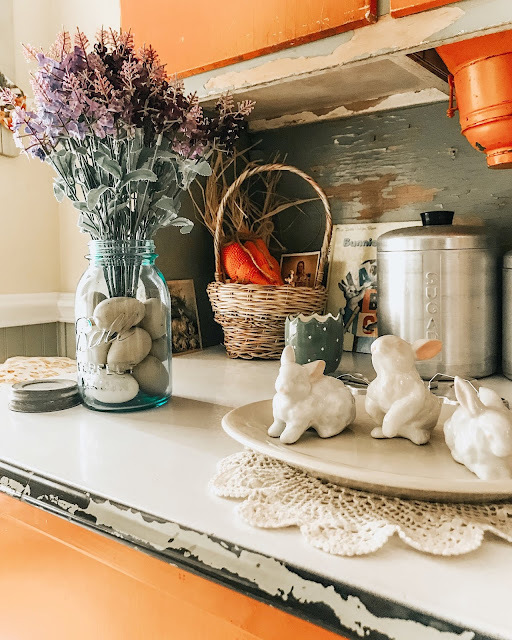 This time I switched out the doily and I filled the largest jar with faux Easter eggs and placed a few stems of Forsythia from our yard in the mix. I didn't leave this display too long after I snapped these photos, because well, fresh stems need water! Isn't it sweet though? I love using florals from our yard to decorate with. That's free decor people! 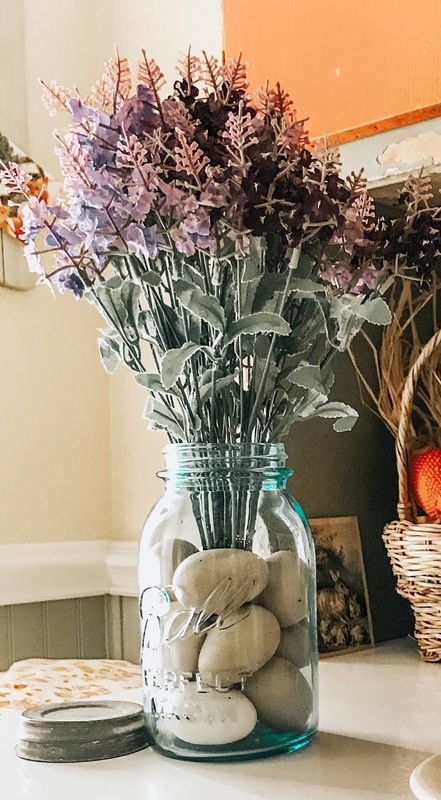 I loved the idea of the faux Easter eggs in a Ball jar, so I grabbed some of my Dollar Tree lavender stems and added them into the center. I think its adorable! 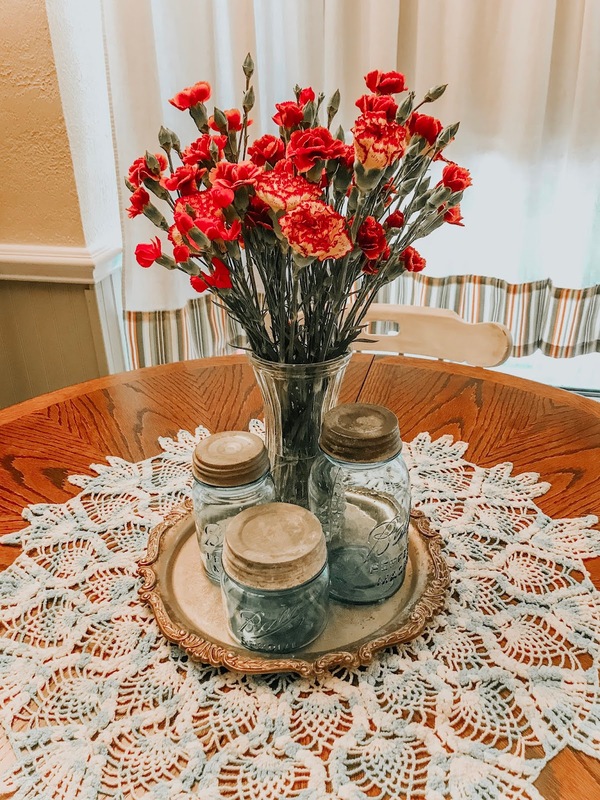 I left it sitting here until my fresh flowers had faded, then I added it to the centerpiece. I also went ahead and created my Easter place setting too. Join me next week when I show you how I arranged each setting just by shopping my home for all the items needed! 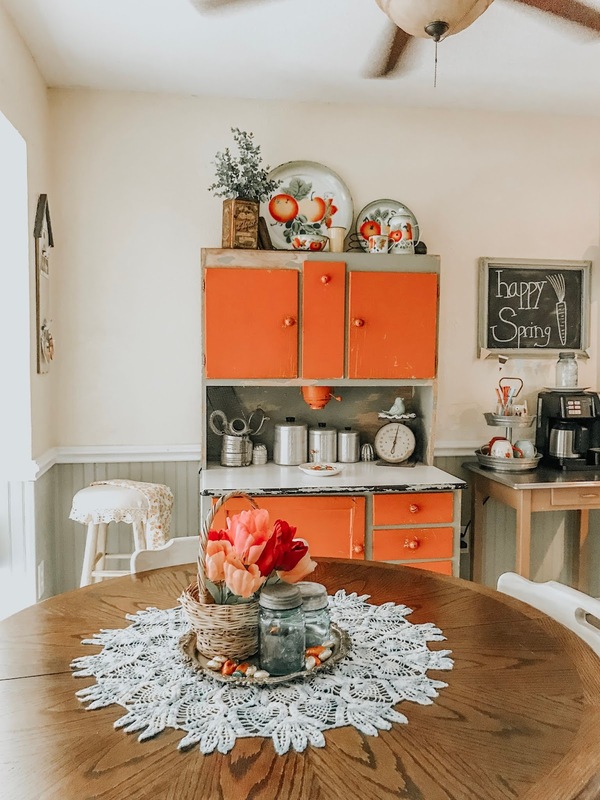 If you loved this idea and want to save it for later, be sure to pin it to your favorite Pinterest board. I have a Pinterest board all set up just for Farmhouse Ideas ideas and I'm pinning something new every day. It doesn't have to be done all at once. It is a slow process in the works! C-ya next time! These lovely and FUN parties! very pretty. I need to decorate more. But, it's just us two. Thank you for sharing at #OverTheMoon. Pinned and shared. Great ideas, Dee! So glad to have you each week at Homestyle Gathering! I love all of your ideas! 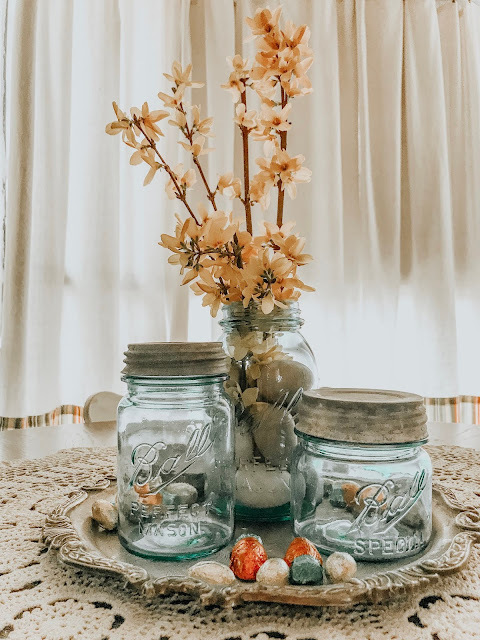 The forsythia is gorgeous, and the blue ball jars are great. I collect them, too! Thanks for sharing at Sweet Inspiration! Great ideas! Love the mason jars. 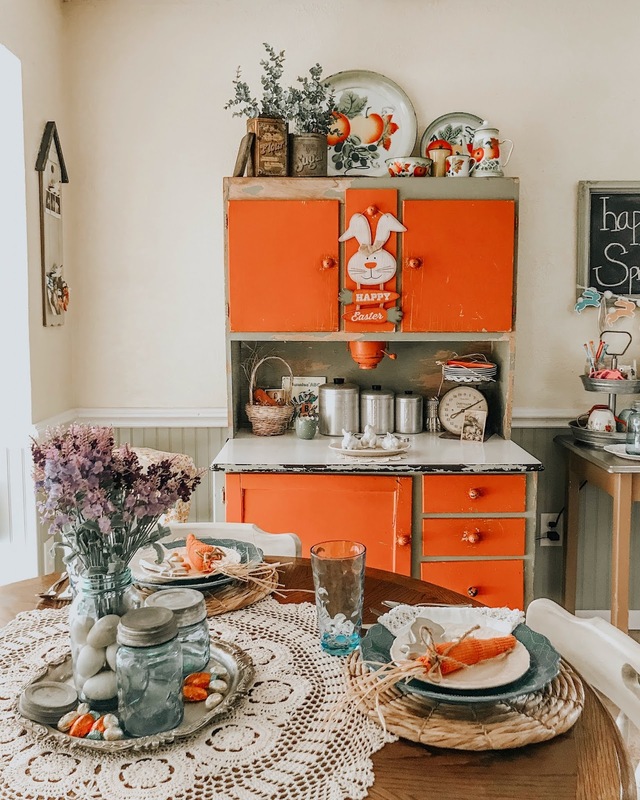 I am happy to feature you at TFT this week. Happy Easter! Hey there! Welcome to Clover House! 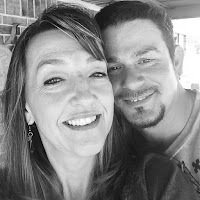 I'm DeeDee and this is my honey, Bobby. 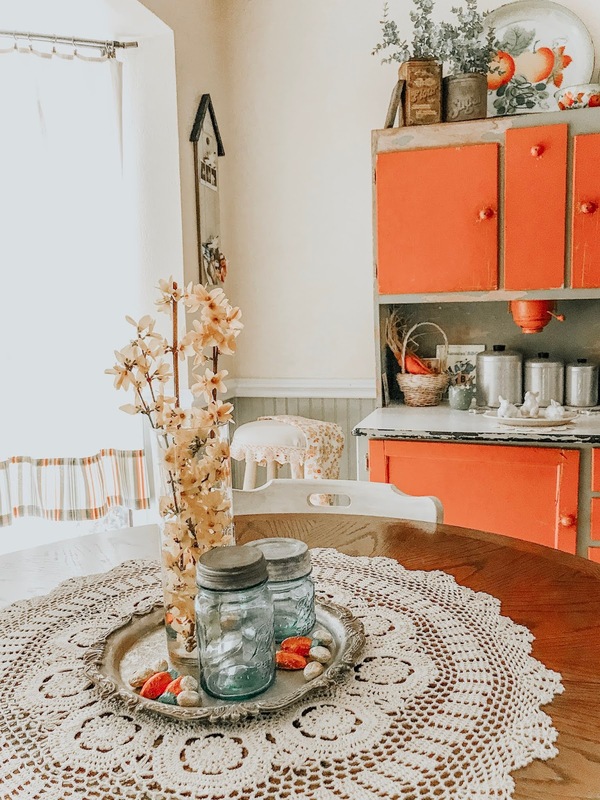 Join us for redos and fix ups of our 1980's home. Also, I'll throw in a recipe or a craft from time to time. Enjoy your visit! The Best Sweet Tea...Secret Ingredient?